At Ambros we have an ever growing range of fanless PCs. These PC rely on passively cooling and as such as silent (when fitted with solid state hard drives) . This type of PC design has become more viable as PCs have became more energy efficient resulting in lower power draw and hence less heat production. Initially we only offered entry level solutions based on Intel Atom processors, but now our fanless options range from Celeron processors, to powerful core I7 processors. This means fanless PCs are no longer an options for only basic tasks, but on the contrary some models are capable of more processor intensive uses. As well as great home PCs, some of our range are excellent commercial solutions. The fanless nature of these PCs means they attract less dust, don’t suffer from fan failure, and the fact that they are silent in operation means they can be used in low noise environments. 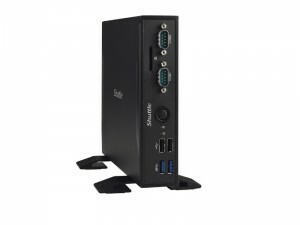 The Shuttle;e DS67U is a perfect commercial PC. It has extremely generous connectivity, featuring multiple USB port, dual gigabit lan, wireless AC, and even com ports useful for EPOS applications. 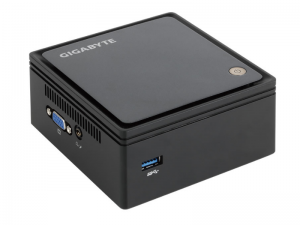 The Gigabyte GB-BXBT-2807 is a hugely popular model. ITs cheap, small, and highly reliable. Perfect as a basic home PC, we have also found its makes a great Digital Signage PC for basic digital signage.